Problem Description — It’s quite common for Photoshop documents to contain a lot of layers. I have some documents here with well over 1000 layers, and I don’t think I’m alone (I have groups for each state of the iOS app usually). It’d be great to be able to filter the layers palette. I realise the complications this might add: Should users be able to edit layers in the search results? If so, how do you handle events like reordering layers? It might be easy to just drop back to the normal (non-search results) view as soon as they do anything, but select the top layer from the search results, or the layer they clicked in the search results. Workaround — Scrolling through layers and groups until the desired layer is found. Or, right clicking in the canvas and selecting the correct layer from the list of layers under the mouse cursor. Searching layers is a definite step in the right direction. I'm surprised it wasn't implemented years ago. What happens when you have a hundred layers filtered down to 3 layers using a search and you change the z-order of one of the current layers? Oh yeah, there's significant issues to be addressed. I realise this opens up many, very complex situations that would be hard to cater for. The best solution I can think of is that the search state is very temporary. So if you searched for something, then clicked on the layer in the Layers palette, the layer would be selected and the search would be closed. Doing other layer-related things (like hitting the keyboard shortcut for changing layer order) might have to close the search as return to the normal Layer palette state, too. Or maybe there's a smarter solution. What we're talking about is more filtering than searching (similar to iTunes). So it's more "hide the non-results" rather than "show the results". Drag "Button's text" below "Button", then cancel search. I've considered reordering to be "place under the layer above", but it could also be defined as "place on top of layer below". Or... certain features could just be disabled when in the search state. No reordering, but allow for opening the Layer Styles or showing/hiding. I realise it's not an easy request! This isn't a new problem though. iTunes does it, as do other apps. You can have a static playlist in iTunes, filter it, reorder while filtering, then remove the filter. Hey Marc, Thanks. I didn't mean to bust your chops. I just wanted an example to show to users that illustrates that what seems like a simple request can bring up complicated questions. You're right, they can be overcome - but need care consideration. I really enjoy thinking about these things. And yep, modal features like this can be a royal pain to build and test. Reordering the refresh button is tricky especially if it is placed between Home and Next, because you can't be sure if the user wanted it right below Home or right above Next (because other layers might exist between them when the filter is off). A simple solution would be to show an arrow that indicates where exactly the Refresh Button will go. (the ^^^) is the arrow I was talking about. This way it clearly indicates where the layer goes. There's also a problem with the "Buttons" group that needs to be addressed. Dragging the "Refresh Button" layer below "Previous Button" should place the "Refresh Button" in the "Buttons" group. Another nice thing would be to have a small [x] button inside the search text input, because the user might want to do more actions while the filter is enabled. Pressing the [x] button would disable the filter. Another nice feature would be to be able to choose if you want the filter to temporarily hide the non-results. This way, the user will be able to see his filtered layers similar to the "Layer Comps" palette. I'm sure that this feature has other implications, but it would really help out a lot of power users. And I'm sure that it's natural to understand that dragging a group while showing filtered results will actually move all the group and its contents. Great improvement would be to add filter textbox on top of the layers palete that would filter out every unmatched layer. One could than name his layers with some prefixes and quickly switch between different sets to focus on current task. Filtered out layers should be automatically locked to prevent unwanted changes. Jeff Tranberry sent this link to me in an email. Wrote up a blog post recently with a an additional idea of taking search, but adding in parameters. I work with 200+ layer photoshop documents often, and being able to search by things such as color coding, if a layer is locked or not, by the type of the layer (text, shape, adjustment layer), etc would be great. I feel like this is a really important addition that would making surfing through layers a breeze, and an incentive for designers to start taking use of color coding, a feature that I feel is underused and underrated. Yes, please Adobe!! It should be possible to search within layers. I often have more than hundreds of layers. The one thing I often use is to use the right mouse click on the photoshop file to choose the layer I need. BUT... it would be better to have a small search box to have a more powerful function to choose layers. I wholesomely support this idea...i was just about to post it until i saw this. This would really save me a LOT of time. I'm very organized in my layer naming but sometimes it just gets SO large that it would be far easier to search for something if i could search for group names at the very least. Eek! Finding related layers in a folder-filled .psd is like finding a needle – or a multitude of them – in a haystack! Here's an item on my wish list...color coding for layers. Since I often make edits to many related items in different folders, it would be great to have a function that would select a number of layers by color (or other tag/label of some kind) and make the global edits simultaneously. Example: I'm creating several Web navigation tabs. I would like to change the font for all the tabs, but I have to open all the associated folders, and then click on each font layer to edit them at the same time. If they were all tagged "orange," I could make a selection of all orange layers with an automated command, and presto, they're all selected and ready for changes - without all that folder-expanding and clicking! Even if the auto function was absent, at least I could SEE them readily in order to shift-click select them. Automated layer selection - bring on the colors!. Love this idea - whilst some of the better designers we work with are well organised, we often inherit PSDs with just a mass of badly labelled, ungrouped layers, so searching via label or attribute would be a great help. As for the re-ordering issue, a really simple solution would be for the results to switch back to the full layer view upon selection of one of the results. You tap in your search query, thinning a few hundred layers down to a handful, and once you click on the one you're after, the view reverts back to all layers, with your chosen layer highlighted and in the middle of the layer window (or top/bottom depending on fit). "Please add a search function for layer names. I want to be able to find a layer by typing its name." "Could you PLEASE make a layer spotlight search in Photoshop just like After Effects has effects spotlight search?" shall we have a Layer Search Option on Layer Window where we can search a Particular layer. I used to do so many experiments when i design that makes my layers goes in crazy numbers. It will be great if Photoshop have this feature. Layer Search Option on Layer Window. - Allowing you to search the Layers window by keyword. Some features I'd really like to see after using Photoshop for YEARS. It also helps to put each request in separate posts if you do need to create a new topic so people can comment and vote on each request separately. would be nice. i've had a few files with over 100 layer... never 1000 though. Would like to see this as a collapsible portion in the Layers pallet. Much like the align pallet has more then one size. I really miss this feature. Usually i select layers via ctrl-click, but if layer is hidden — then it's almost lost forever, even though i gave it a name. Great job done!! I love this new feature... Awesome!!! If you have ideas for improvements/refinements for Layer Search, please create new topics for individual ideas. Thank you. If you have ideas for improvements/refinements for Layer Search. Please create new topics for individual ideas. Thank you. 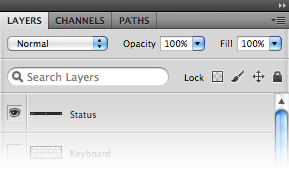 i just wanna suggest you for the next ver of photoshop or whatever, to make a search button for layers name. im working with many layers all the time, and this kind of search button can be very useful for me and for everyone! a great idea for you !. This reply was created from a merged topic originally titled Photoshop layer search. Hi, i usually work pretty tidy with Photoshop, trying to name my layers and effects. Given there are probably many people who do that, i believe that a great idea is to be able to filter layer by using a search filter where you can manually input the name of the layer and get it singled out.